With Forked Tongues: Why Chibesakunda’s Majority Ruling in Attorney General v. Mutuna & Others is Flawed | Elias Munshya, LL.M, MBA, M.DIV. This sentence as much is it is conceived with controversy is also pregnant with a lot of meaning. But the questions still remain. Was this sentence put into the judgment as an afterthought? Did the majority of the four judges have a disagreement such that to appease someone in their midst, they had to insert these words? What exactly did they mean when they held that it would be advisable for the tribunal to not proceed? This sentence of all the other issues in the judgment provides perhaps the greatest insight into what was really at stake when the Supreme Court took up this issue. I wish to argue that the judgment of the Supreme Court is fundamentally flawed and the basis upon which they held to discharge the stay of proceedings was faulty to say the least. The facts of the case under consideration are very clear. President Michael Sata used his powers under Article 98 of the Constitution to suspend three judges – Justice Kajimanga, Justice Mutuna and Justice Musonda. He consequently, constituted a judicial tribunal to make enquiries into their misconduct. The president alleged that he had credible information that the three had misconducted themselves in their discharge of judicial duties. After the president had written them, they sought leave from the High Court and a stay of proceedings to restrain the President from going ahead with the tribunal while they contested his powers to suspend them and constitute a tribunal. At issue was whether the President, in his use of Article 98 powers had contravened Article 91 of the Constitution. Article 91 envisages the Judicial Complaints Authority as the appropriate body to hear grievances about judicial misconduct. As such, they argued that the president’s powers in Article 98 must be exercised in conformity with Article 91 so that the President must at least consult with the Chief Justice and with the Judicial Complaints Authority before he could execute his powers in Article 98. Additionally, Justice Mutuna and others contended that by appointing a tribunal to make enquiries into a matter that was before court, the President had usurped the powers of the Supreme Court of Zambia. There are many elements to the issues raised by the judges but for brevity and clarity we should leave them at that. In the High Court, Justice Fulgence Chisanga, granted leave to the suspended judges and held that prima facie they had arguable grounds upon which a stay of proceedings against the tribunal could be granted. 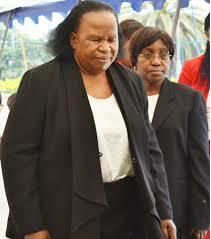 The State through both the Attorney General, Mumba Malila SC and the Solicitor General Musa Mwenye SC, instead went to Justice Chisanga and asked her to discharge the stay of proceedings. She refused and instead ordered trial of substantive issues that the suspended judges had raised. It was at this point that the Attorney General appealed to the Supreme Court. The court was asked 9 questions among many other elements. The principal issues being that High Court Justice Chisanga should have discharged the the stay of proceedings. They also argued that the president did have the power according to Article 98 of the constitution to suspend the judges and institute the tribunal. In view of the two principal articles of the constitution the Supreme Court was invited to rule on whether by exercising Article 98 powers, the President should have considered judicial independence as articulated in Article 91 of the Constitution. The Supreme Court’s judgment is quite surprising to say the least. Perhaps the most astounding of all they held, was ruling that the President was legally right in using his constitutional powers to suspend the judges, but at the same time, they provided “advise” that the tribunal should not go ahead. Surprisingly though, this ruling and the reasons the Supreme Court has advanced for stating that Article 98 powers could be exercised without recourse to Article 91 and in fact without any further recourse to the Judicial Complaints Authority deserves some analysis. The Supreme Court judges confused matters when they held that the appropriate method of constitutional interpretation in this matter should be “literal rule of interpretation.” To buttress this position, the court relied on the Miyanda, Chiluba and the Mwanawasa cases. The literal rule of interpretation according to Justice Chibesakunda is that the ordinary meaning and ordinary grammatical meaning should be assigned to constitutional texts. I am of the view that the rule of interpretation was not at issue in this matter. The issue was not whether the meaning of Article 98 was ambiguous or not. What was at issue was comparative constitutional law. The question should have been whether Article 98 and Article 91 could be interpreted harmoniously or not. Coming to any conclusion was not going to be dependent on “natural or even grammatical” meaning of any text. Nevertheless, if the rules of interpretation were ever to be relevant in this case, then it should not be the “literal” or the “natural” rule that should suffice, but rather the “purposive interpretation method.” And in fact, I am of the opinion that the “purposive interpretation method” would be more helpful though in resolving the interplay of Article 98 and Article 91. The purposive interpretation looks at the wider context of law and seeks to interpret constitutional texts in ways that give effect to wider concepts and fundamentals of the law. I must return to this latter. The other questionable thought pattern employed by Justice Chibesakunda and the majority concerns their “dualization” of Article 98 and Article 91. This is fundamentally offensive at constitutional law. In this duality, Justice Chibesakunda and her majority envision Article 98 and Article 91 as existing in different planes and in fact in different universes, as it were, and as such, they do not in any way see how the exercise of the President’s powers in Article 98 could in fact impact on the exercise of Article 91 powers. Chibesakunda ACJ chose to ignore any interaction of these articles and strictly created a dichotomy that problematically, divorces these articles even though these two articles have impact upon the common subject matter. It is in this vein, that Chibesakunda sees the Judicial Code of Conduct (which is a product of statute) not as a broad product of constitutionalism, but rather simply as a product of one isolated constitutional article, Article 91, of the Constitution that cannot impact on any other articles. This is problematic. The Judicial Code of Conduct is a constitutional tool that can be used by both the Executive and the Judiciary to deal with judicial misconduct. But to conceptualize it simply as a product of one universe inhabited by Article 91 and not be a subject of Article 98 of the constitution is to create a constitutional dichotomy that by itself betrays the very tenets of constitutionalism. A literal interpretation of the Judicial Code of Conduct to the extent that it is interpreted only as a child of Article 91 and not Article 98 is inconsistent. For example, it is in the preamble to the Constitution of Zambia where Zambia is declared as a “Christian Nation”. And yet while this is the case within the preamble, the Supreme Court has “purposively” interpreted this provision and robbed it of any justiciable value. This is what they held in the case of Roy Clarke v Attorney General. That being the case, how come this time when it comes to the Judicial Code of Conduct the same court is now interpreting the preamble in a “literal” sense? This thinking is problematic to the extent that it erodes and offends the doctrine of the separation of powers. Zambia being a common law country is founded on several constitutional principles. I should say that while a written constitution is the supreme law of Zambia, the constitution itself predicates from unwritten principles and values that should underline any subsequent interpretation of the constitutional text. As such, the courts of law are called to give effect both to the text and to the spirit of the text of the Zambian constitution. One of those principles undergirding the spirit of our written constitution is the wellspring of separation of powers. In simple terms, this principle basically states that the Judiciary is not subordinated to the Executive. As such, the president in all his powers is not head of the judiciary and cannot possibly be its “guardian”. That being the case, the best way to approach constitutional text that seem to give more power to the president over the judiciary, is to interpret such texts in ways that does not offend the principle of separation of powers. It is on this point that the Supreme Court erred. According to Chibesakunda: “…the legislators intended to lay down procedures of making it possible for the President as Head of State to deal with that exclusive class of adjudicators without recourse to the Judicial Complaints Authority”. Further, Justice Chibesakunda sees the presidential exercise of Article 98 powers to be in the common good of our democracy. But as stated by the suspended judges in their affidavits, one of the reasons why President Sata instituted the tribunal is not because of any meaningful democratic ideals but rather it was connected to a ruling from Mr. Justice Mutuna that went against the President’s political collaborators. As such, the idea that it is in the interest of democracy that a president should suspend judges is at least, prima facie, questionable in view of the reasons why President Sata constituted the tribunal. It cannot be democratic, that which is done to only protect the president’s close business and political associates. Closely connected to the above paragraph, the Supreme Court seems to imply that since Article 98 powers are exercised only in an executive capacity, this cannot offend the separation of powers. This is a lame reason. According to Justice Chibesakunda, the president’s invocation of Article 98 powers only deals with investigation of a judge and not a prosecution of a judge. This so-called investigation doctrine is even more belligerent. Couldn’t the honorable court have looked at the impact that such investigations could have on the independence and impartiality of the judges? Should judges loose their independence simply because the tribunals set up under Article 98 are just investigatory in nature and not prosecutorial in nature? This being the case, it means that the “investigative” doctrine that Chibesakunda seem to be inventing is untenable. It cannot be investigative that which will make categorical recommendations about the fate of a suspended high court judge. This is not how investigations work. The fact that the Judge Chikopo (intentionally misspelled here) tribunal will in fact, make recommendations binding on President Michael Sata should move the tribunal from being an investigative body to being a judicial body and if that is the case, then judicial review that seeks to question the very basis of such powers should at least be considered by the courts of law. We also hold the view that His Excellency was not exercising quasi judicial powers. We hold the view that conferment of wider discretionary power vested in His Excellency are indicative of the absence of His Excellency acting judiciously, see the case of R vs Governor of Brixton. While indeed the Court might claim that the President is not acting in a quasi-judicial capacity when he sets up the tribunal, the fact that the tribunal’s recommendations should be carried out by the president without discretion should lead to the conclusion that this exercise of Article 98 powers is in fact quasi-judicial. Indeed, had the tribunal been only an investigative agency and not a judicial one. Indeed had the tribunal only investigated the facts of the cases without proffering any binding recommendations, the President could have gotten away with this doctrine. But unfortunately it is not so. As such, if this does unchallenged, the president will act to fire the judges on the basis of the recommendations from the tribunal. As I have stated above: this should bind the president to act judicially. The next problem with the Supreme Court ruling is couched in very interesting language. According to Justice Chibesakunda: In order to guard jealously the sanctity of our Constitution, we cannot give Constitutional provisions a meaning that may impeach the explicit, implicit and clear language used. But what the learned lady misses in so saying is that the constitution does not only contain the powers of the President, it also contains the powers of the judiciary. Constitutionalism is not only a commitment to presidential or executive powers; it is also a commitment to judicial powers. It falls upon the judges to ensure a balance of these powers if a conflict is noted. Prima facie, the suspended judges noted a clear conflict of powers in Article 98 and Article 91, it was for the court to address this issue rather than only give credence to the immutable power of a President. In spite of being a lady of tremendous political insight and experience, Justice Chibesakunda seems to have conveniently left out the political realities in her interpretation of presidential powers. No judge of the Supreme Court should take himself or herself as living in a legal cave, unaffected by current political realities. These judges are human and do know the impact of political patronages going on in our democracy. As such, it is quite disturbing for Justice Chibesakunda to confer reasonability on presidential action simply because the president should have had “credible information” when deciding to suspend Judges Mutuna, Musonda, and Kajimanga. According to Justice Chibesakunda it is from the authoritative position of “His Excellency” where she and her colleagues infer the idea that he reasoned “reasonably.” I can’t just figure out how Chibesakunda is reasoning here. She is saying that the President cannot possibly act irrationally or unreasonably simply because he is the authoritative president of our republic and head of our State. In my opinion, no opinion of the Supreme Court can get weirder than this. As if that was not enough confusion, the Courts continued to state, “it would be illogical and unreasonable to hold that he did not receive credible information as President for him to act as he did.” This sentence does not make sense to me. So is the Supreme Court becoming a judge of what is credible information or not? Should intelligence information that a president receives be the basis upon which he can unilaterally fire judges? Is President Sata the Overall Authority on “Everything”? And then the Supreme Court comes up with something just unusual. The Court stated that the President is “the overall authority on everything”. What exactly does this statement mean? In Zambia, the President holds executive authority, but this cannot be conceptualized as being the “overall authority on everything”. Which “everything” did the Supreme Court mean here? And then they justify this overall authority over everything doctrine by claiming that the President’s sources are “exclusive to the public domain and must be impeccable”. Reading this, one would wonder whether this is a judicial opinion, or it is some praise prose intended to catch the attention of a tumultuous suitor. The fact that the president has impeccable sources exclusive to the public domain does not immune the president from acting judicially or quasi-judicially in instituting tribunals which themselves have judicial effects. In fact, human experience has taught us very eloquently that even the most intrusive of executive powers can get its intelligence wrong. Intelligence information that the president has at his disposal is insufficient on its own to form the basis for judicial or even quasi-judicial functions. It is never contemplated in our constitutional make-up that the executive privilege of the President should be so used as to intimidate and suspend judges on the basis of “credible impeccable information” at the disposal of only one man. Justice Chibesakunda and the cohort of her majority in this case might need reminding that Zambia is not a dictatorship; it is a democracy. Perhaps, here, I could borrow words of great judicial wisdom from Lady Mambilima DCJ. In one of the celebrated cases she stated very eloquently that “The president is not above the law.” This is the line, Chibesakunda needs to repeat to herself daily until it sinks in. With these words ended one of Zambia’s most controversial Supreme Court opinions. Without elaborating on those “circumstances of this matter,” it is up to ordinary Zambians to infer why the Supreme Court felt it was not advisable to proceed with the tribunal in spite of holding, with a forked tongue, that President Sata exercised his powers correctly. In my humble opinion, the Supreme Court so advised because, they really did not have any reason to hold otherwise. Their reasoning was flawed. (c) 2013. This article is not intended to provide legal advice. Only members of the Zambian Bar can provide specific legal advise on questions raised in this article. This article has been revised from its earlier editions. Munshya wa Munshya asserts all intellectual property rights to this work. Fastidious respond in return of this difficulty with solid arguments and explaining the whole thing concerning that. uses for creating new webpage or even a weblog from start to end. I’ve been exploring for a little for any high-quality articles or weblog posts on this kiind of house . Exploring in Yahoo I finally stumbled uupon this site. Studying this info So i’m happy to convey that I’ve a very excellent unncanny feeling I discovered just what I needed. web site and provides it a glane on a constant basis. way in which you say it. You makie it enjoyable and you still carde forr to keep itt smart. Hi, the whole thing is going well here and ofcourse every one is sharing data, that’s genuinely excellent, keep up writing. I was recommendd thiss wweb site by my cousin. I am not sure whether this post is written byy him as nobody else know such detailed about my problem. What i don’t understood is if truth be told how you’re now not actually much more smartly-preferred than you might be now. Its like men and women don’t seem to be involved until it’s something to do with Lady gaga! himm as nobody else know suych detailed abkut my problem. You’re amazing! Interesting reading. I agree, this was a weird decision indeed. The literal approach in interpretation of statutes usually produces undesirable and unfair results. I would go so far as to suggest that the learned Munshya is being very generous in his concluding sentence, because, in my humble opinion, there was no reasoning at all. This was a political bargain by the learned Acting Chief and Acting Deputy Chief Justices: we have given you your Tribunal, now confirm us in our jobs. As the learned Munshya points out, that last qualifier, about the honourable court “advising” that the Tribunal should not proceed, was inserted in deference to the minority who had got it right; the Tribunal was clearly a political tool for which there was no legal basis, therefore the words: “the circumstances of this case”. I must add that, unlike Munshya Wa Munshya, mine really is a humble opinion as, unlike Munshya who is a lawyer, I am not. Forked Tongues: Why Chibesakunda’s Majority Ruling in Attorney General v.